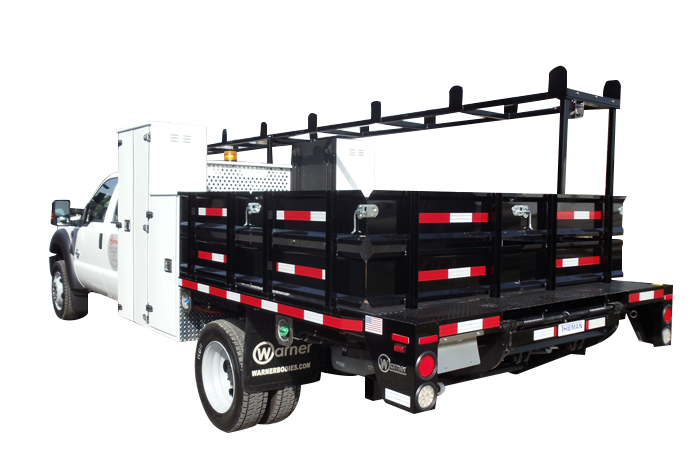 Warner's Contractor Platform Bodies are ideal for hauling equipment and material to job sites and are available in two models: Standard Duty with internal stake pockets, or Heavy Duty with external stake pockets and heavy-duty tie down rub rails. Both models can be custom built in either steel or heavy-duty aluminum, and are available with a variety of options, including a hide-away fifth-wheel hitch, under-bed custom tool boxes, full-depth tapered rear aprons, and standard or heavy-duty tapered bulkheads. tread plate decking, and come with a full five-year limited warranty.